We are delighted that you have chosen our office to provide you with the highest quality dental care. Our goal is to create the best dental experience that you and your family desire. That’s why we’re called Desired Dental! We know what it is that you’ve been dreaming about, and we’re ready to make that smile a reality. We’re your choice for quality dental care in Lorton, Virginia and surrounding communities of Woodbridge, Springfield, Alexandria, and more. Choosing the right dental home, with the right dentist and the services you need to achieve your smile, can be difficult. Not at Desired Dental! 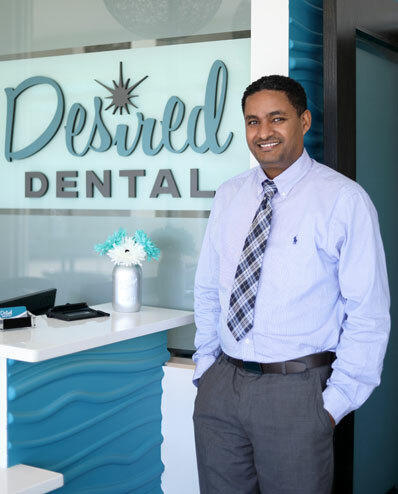 Because whatever you need, Dr. Assefa Demewoz and his team are here for you. We offer comprehensive dental services in our Lorton office, with various treatments you need, you can rest assured that you’re in the hands of the team you trust. Saturday and Evening Hours! Schedule an Appointment Today! Our safe, gentle dentistry is enhanced by Dr. Demewoz’s compassionate, calming demeanor and commitment to every smile. Your experience at the dentist has just taken a whole new turn at Desired Dental. Find out what truly accessible dental care can do for you. Turn your desires into smiles and contact us today!